With all of the focus on new tax rates after Congress green-lighted tax reform, it’s easy to forget that some of the biggest changes don’t have anything to do with tax rates: They’re about deductions. For 2018, the standard deduction amounts will increase from $6,500 for individuals, $9,550 for heads of households (HOH), and $13,000 for married couples filing jointly, to $12,000 for individuals, $18,000 for HOH, and $24,000 for married couples filing jointly. Most taxpayers will claim the standard deduction. Initially, the change in the standard deduction amounts was meant to simplify the deduction scheme. In other words, most of the itemized deductions would have simply disappeared, leaving behind (initially) the charitable donation deduction and the home mortgage interest deduction. Over the past few weeks, however, those itemized deductions – those found on a Schedule A – have been tweaked. 1. Medical and Dental Expenses. Medical and dental expenses remain in place with a lower floor. We call it the “floor” because you can only deduct expenses over that number. The floor – before tax reform – was 10% of your adjusted gross income (AGI). Here’s how it worked. Let’s say your AGI is $40,000 and your medical expenses were $5,000. Assuming you itemized, you could claim $1,000 as a deduction, or $5,000 in expenses less the floor (10% x $40,000 = $4,000). Under tax reform, the 7.5% floor is back in place for two years beginning January 1, 2017 – that means that it applies to the 2017 tax year. So assuming the same facts above, you can claim $2,000 as a deduction, or $5,000 in expenses less the floor (7.5% x $40,000 = $3,000). 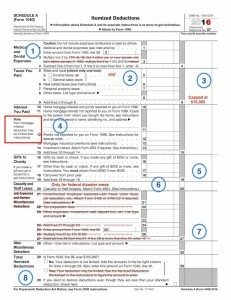 Again, unlike most of the provisions in the bill, the provision is effective retroactively to the beginning of this year – so you’ll see this change on your 2017 and your 2018 tax returns. 2. State and Local Taxes. 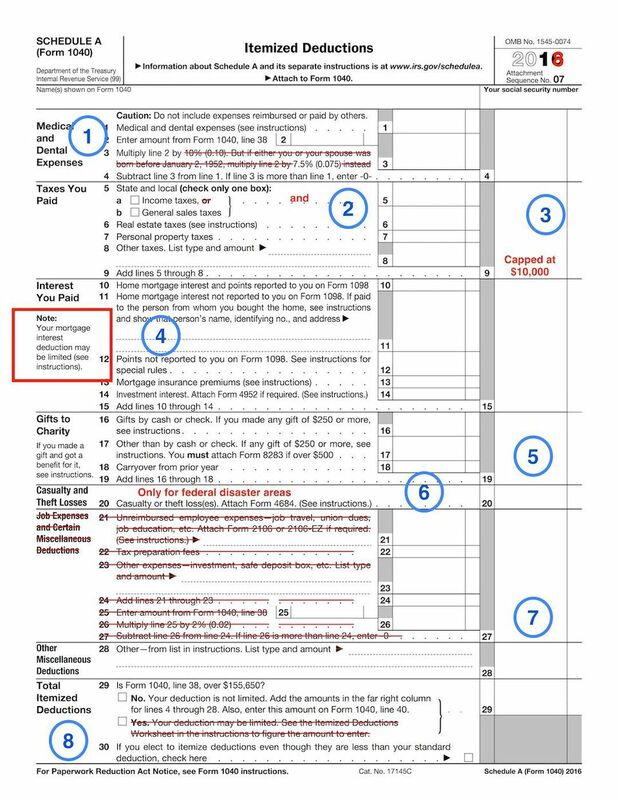 Under tax reform, deductions for state and local sales, income, and property taxes normally deducted on a Schedule A remain in place but are limited (see #3 below). Foreign real property taxes may not be deducted under this exception. 3. SALT caps. While SALT deductions remain in place, there is a cap on the aggregate, meaning that the amount that you are claiming for all state and local sales, income, and property taxes together may not exceed $10,000 ($5,000 for married taxpayers filing separately). State, local, and foreign property taxes, and sales taxes which are deductible on Schedule C, Schedule E, or Schedule F are not capped. This means that, for example, rental property – even if held individually and not in a separate entity – remains deductible and not subject to these limitations. And yes, Congress already knows what you’re planning, so amounts paid in 2017 for state or local income tax which is imposed for the 2018 tax year will be treated as paid in 2018. In other words, you can’t pre-pay your 2018 state and local income taxes in 2017 to avoid the cap. There is not, to date, a similar restriction for property taxes. 4. Home Mortgage Interest. So, first, the home mortgage interest deduction didn’t disappear. But it did get modified. Here’s what you need to know. First, the definition of acquisition indebtedness is important: It’s indebtedness that is incurred in acquiring, constructing, or substantially improving a qualified residence of the taxpayer and which secures the residence. Home equity indebtedness is indebtedness other than acquisition indebtedness that is secured by a qualified residence. Those distinctions are important (more in a moment) no matter what they’re called by you or by the bank. As of December 15, 2017, there’s a limit on acquisition indebtedness – your mortgage used to buy, build or improve your home – of $750,000 ($375,000 for married taxpayers filing separately). For mortgages taken out before December 15, 2017, the limit is $1,000,000 ($500,000 for married taxpayers filing separately). It’s even more complicated because beginning in 2026, the cap goes back up to $1,000,000, no matter when you took out the mortgage. And here’s where that definition is super important: For tax years 2018 through 2025, there is no deduction available for interest on home equity indebtedness. 5. Charitable donations. Charitable donations remain deductible under tax reform. The rules are largely the same with a few changes. First, the percentage limit for charitable for cash donations by an individual taxpayer to public charities and certain other organizations increases from 50% to 60%. Two, taxpayers are no longer entitled to deduct payments made to a college or college athletic department (or similar) in exchange for college athletic event ticket or seating rights at a stadium. Those provisions are effective beginning in 2018. Effective beginning in 2017, the provision which allows for an exception to the substantiation rule if the donee organization files a return is repealed. What this means to taxpayers: Always get a receipt. 6. Casualty and Theft Losses. The deduction for personal casualty and theft losses is repealed for the tax years 2018 through 2025 except for those losses attributable to a federal disaster as declared by the President (generally, this is meant to allow some relief for victims of Hurricanes Harvey, Irma, and Maria). 7. Job Expenses and Miscellaneous Deductions subject to 2% floor. Miscellaneous deductions which exceed 2% of your AGI will be eliminated for the tax years 2018 through 2025. This includes deductions for unreimbursed employee expenses and tax preparation expenses. To be clear, it includes expenses that you incur in your job that are not reimbursed, like tools and supplies; required uniforms not suitable for ordinary wear (like those ABBA costumes); dues and subscriptions; and job search expenses. These expenses also include unreimbursed travel and mileage, as well as the home office deduction. Please note that the elimination of unreimbursed employee expenses only affects taxpayers who claim an employee-related deduction on Schedule A. If, as a business owner, you typically file a Schedule C, your business-related deductions are not affected by the elimination of Schedule A deductions. 8. Itemized Deductions. The overall limit on itemized deductions is suspended for the tax years 2018 through 2025.